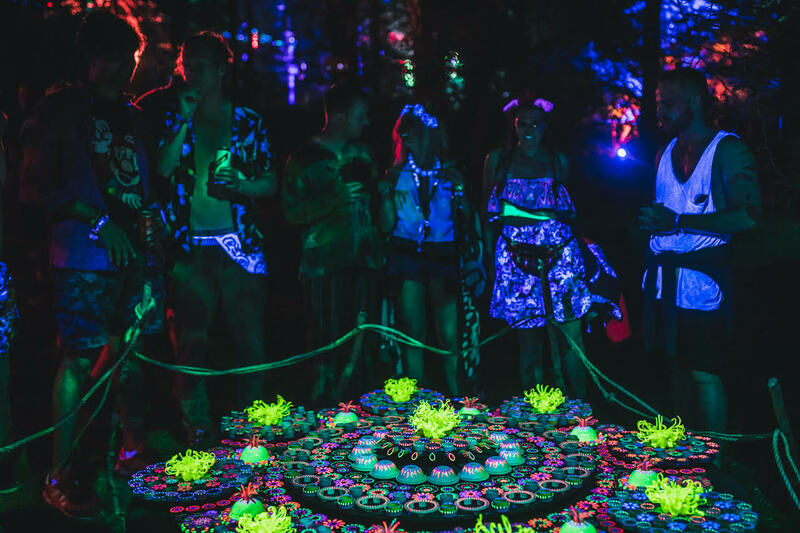 This year’s festival was the most incredible iteration yet for our art department, as installation after installation adorned the Coney Woods, creating an environment so immersive it was all encompassing. 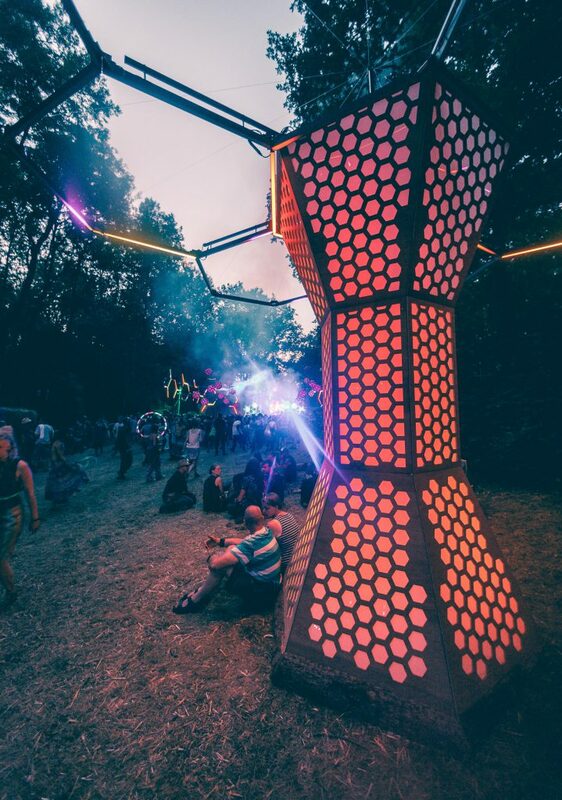 For those of you who journeyed down to the Liquid Stage, you may remember the stunning, pulsating lighting towers half way down the Liquid drag just past the bar. 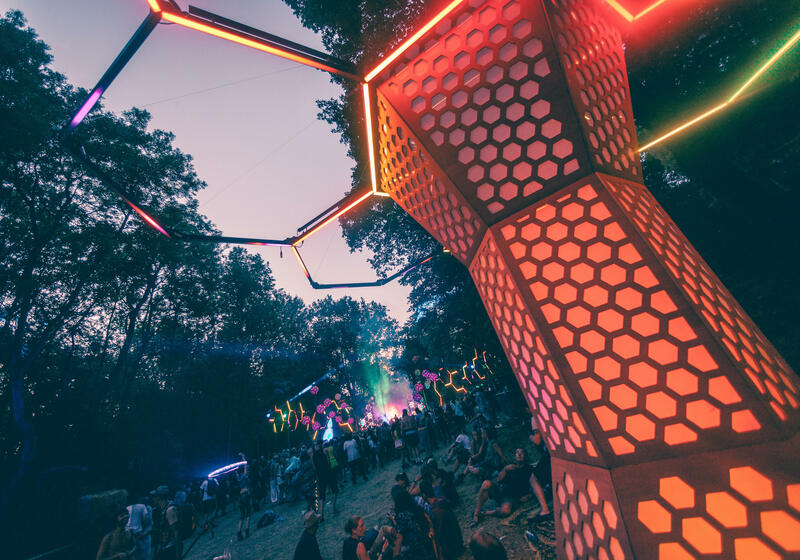 The installation was built by the talented Chris Carr, aka Lucid, and tied in beautifully with the Liquid stage in design, colours, and even the lighting show itself using DMX controlled LED technology. Thanks to our friend Zoe at the V&A we were blessed with the donation of various props and materials from the Opera exhibition in February 2018. 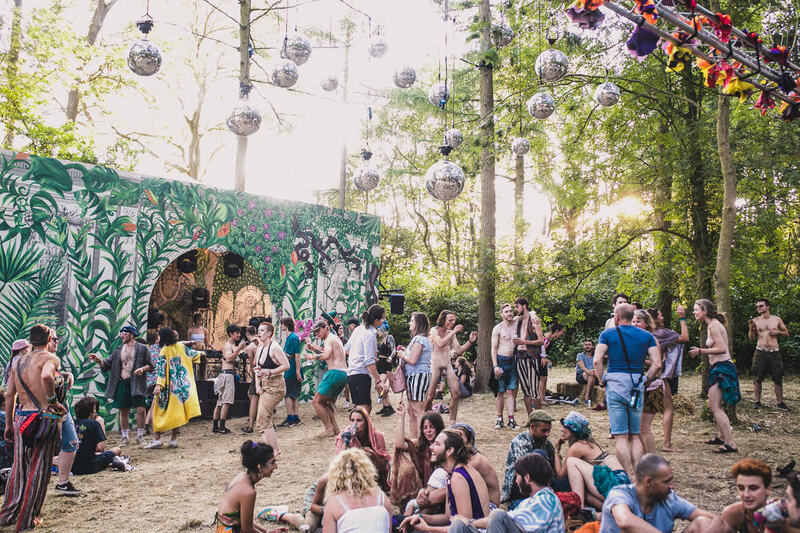 Recycling of materials and sustainability are core values of Noisily, and being able to reuse something so beautiful and well-built was a perfect direction to move with the design of our new stage, the Parliament of Funk. Thanks to a team of talented painters and set-builders we were not only able to bring these materials back to life but to add our own fingerprint. We wanted to create the feel of nature reclaiming this Italian opera set – from Kensington to Coney woods – the structure had to feel at home at Noisily, and it did. Alice came to us through our Noisily Arts Application, and created a stunning installation made entirely of recycled materials made especially for Noisily. It had moving parts and multiple spinning elements, and we were so happy to be able to meet engage with a new artist, providing a platform for creativity which resonated so well with our ethos of sustainability. 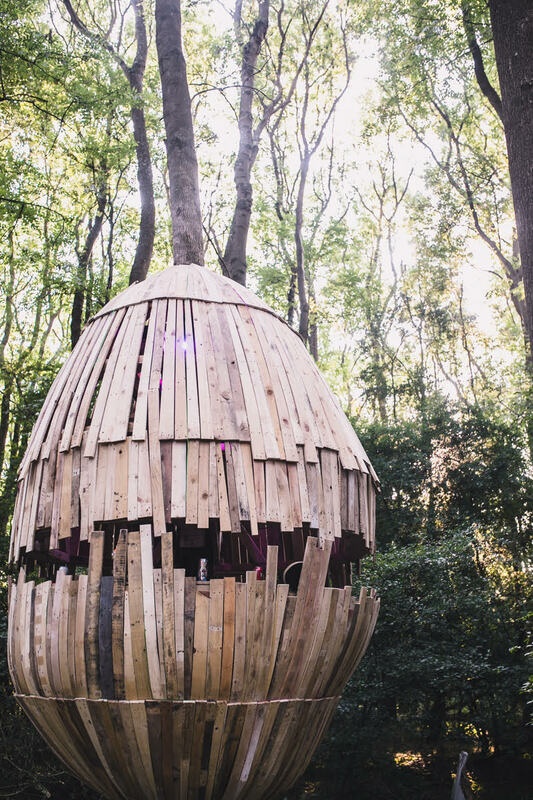 Mandin, an art & design collective formed of six design graduates and friends from Brunel University London, came together to create an epic egg in the woodland corridor between the festival floor and our Mind Body Soul area up top. It was truly fantastic to see the project developing from 3D designs and renders, all the way to the woods where it still stands today as winter closes in, wrapped around a mighty Ash tree in the woods, made entirely of reclaimed materials. Another set of applicants to come through our Art Grants, they worked tirelessly to get the project finished in time for the gates to open. No mean feat with the amount of bespoke woodwork and joinery needed to get the egg up and running! It was an awesome place to hang out, take five, and have those weird and wonderful festival conversations which strike up in those cool and quirky places you stumble upon. See you there in 2019! Dave Green is a leading specialist in technological innovations. Recently launching with GMUNK ‘Lucid’ a short film using the flying screen technology he has been co-developing. 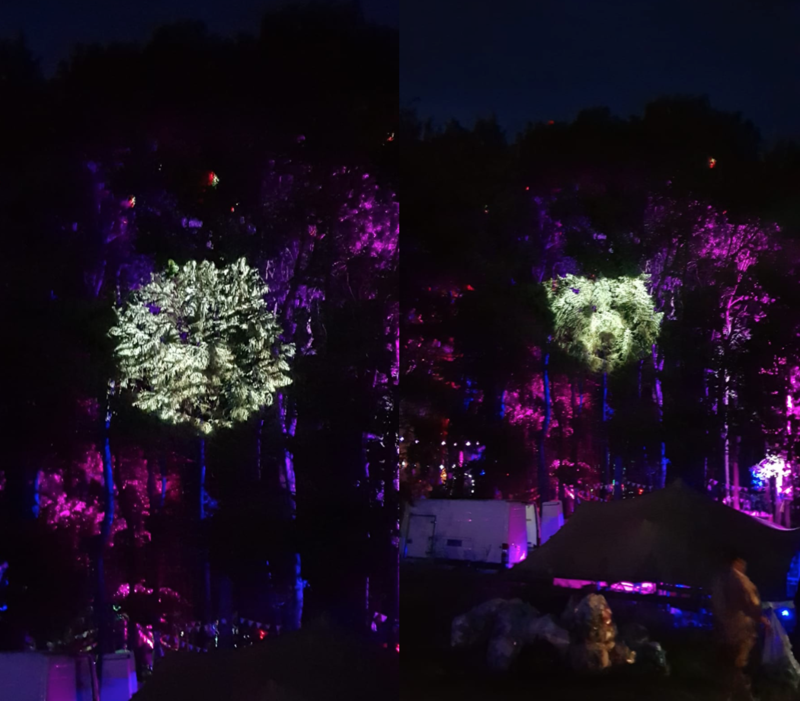 https://vimeo.com/288897461 At Noisily he projected animals faces onto our canopy, which looked absolutely spectacular at night time as people walked through the woods. 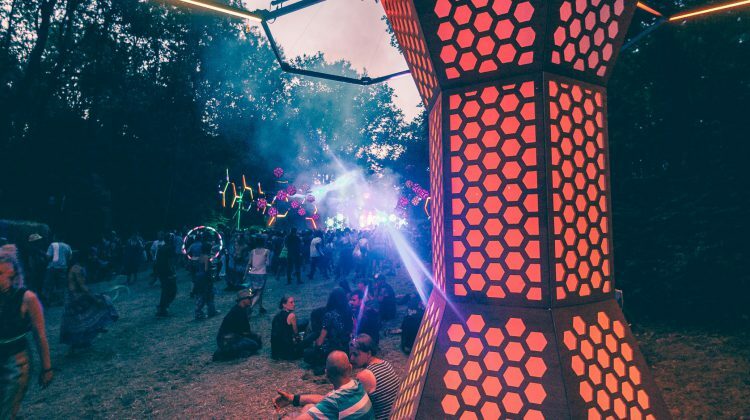 Ruth first worked with Dave fifteen years ago during the early years of Glade festival and Liquid connective parties… “At the time, I had a desire to drive cherry pickers and take over the world with art, Dave was already set on his way to doing the latter! It is always such a pleasure to continue to work with people after so much time, people flourishing within their industries but still holding our culture so close to their hearts.” Here here!